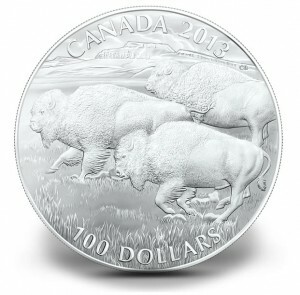 The Royal Canadian Mint is now accepting pre-orders for the 2013 $100 Bison Silver Coin, the debuting release from its Wildlife in Motion series that features $100 silver coins that sell at face value. Collector demand for the pure silver coins is expected to be strong. The Mint’s similar Exchange $20 for $20 program has been met with intense public demand leading to sell-outs. The most recent release, the 2013 $20 Wolf Silver Coin, is at 96% of its 250,000 mintage according to the Royal Canadian Mint. The mintage limit for the 2013 $100 Bison Silver Coin is set at 50,000. The reverse coin design by Claudio D’Angelo captures three bison running along the Canadian countryside. Surrounding the scene are inscriptions reading ‘CANADA’, ‘2013’ and the legal tender face value of ‘100 DOLLARS’. Obverses show a portrait of Queen Elizabeth II by Susanna Blunt. Inscriptions include ‘ELIZABETH II’ and ‘D.G. REGINA’. Each coin is struck to matte proof quality from 99.99% pure silver. They feature a serrated edge and a diameter of 40 mm. Total gross weight of every $100 Bison Silver Coin is listed as 31.6 grams. This equates to about 1.016 troy ounces of silver. Based on the recent spot price of silver of $22.87, each coin has an approximate melt value of $23.24. Currently, the 2013 $100 Bison Silver Coin is available to Royal Canadian Mint Master’s Club members. These are customers who have spent more than $999.99 in RCM products in a consecutive 365 days based on the first date of purchase. Ordering will open for everyone in a few days. 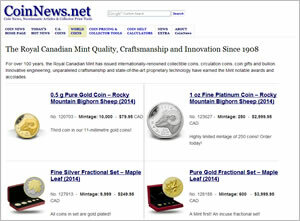 Visit www.mint.ca for updates. 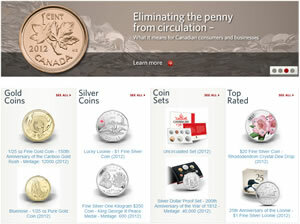 Update: Sales opened fully for the silver coin on Thursday, May 16, 2013. While these silver coins sell at face value and are GST/HST/PST tax exempt, the Mint does charge for shipping and tax on shipping. Master’s Club members are not charged shipping within the US and Canada. Just ordered my allocation of three. It’s definitely a win win! Get them while you can! They’ll all be gone tomorrow! I understand this is the 1st of a series; any idea how many coins are included in that series? I believe it’s 50,000 in the series. sorry, misunderstood.. I know 50,000 in this first coin issued.. Not sure how many total coins in series. For whatever reason, the product page for this particular item now reads, Phone Only.” Does this mean they’re close to a sell out or has the RCM website ordering undergoing some form of maintenance? I called on the phone on May 17th and was told i was on a waiting list. Please beware that banks and businesses are not obliged to accept the $100 coin as $100 worth of cash despite the legal tender nominal of $100. I highly recommend not to take these to the banks, as their are lots of collectors that are willing to give you $100 for the coin. Called BMO Harris in US, they said they could get me $100 in Canadian fund. The redemption of this coin is not a big issue.